My sweetie and I drove down from central NJ with Gina Rosich from the subtext_in_xena list and her roommate James. We got there around 12:30 pm on Saturday, and couldn't find anyone else from the list, although we tried. We did meet up with one other list-person during the weekend, though. The con itself... I loved the guests! They were all wonderful. Danielle Cormack was totally wired, completely energetic and really fun. Her "Ephiny" rap was hilarious. Hudson was campy -- she was obviously having fun and she also seems to plan her wardrobe for these things very carefully, because she was the only one not dressed in comfy clothes. She was wearing a long black silk dress ("This is my mourning dress") and a sheer black scarf draped over her head, which she pulled off to reveal a very short haircut. She kept her skirt pulled up so her legs were exposed most of the time, because it was hot up there. I think it got hotter in the room when she did that! That was Saturday. Hudson was obviously the big draw of the weekend; we got gold seats (row B) for that day and preferred (row T) for Sunday, and we discovered that on Sunday they had pulled out a whole section of reserved seats and made them general, so there were no rows K through S -- I was confused at first when we'd sat down in row T and there was someone with a sticker that said row J in front of us...and sure enough, it went "...I, J, T, U..." At least that meant we got our autographs quicker. There was a far smaller crowd on Sunday. 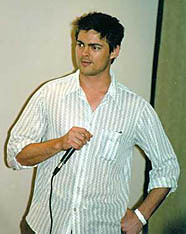 Karl Urban was pretty relaxed and seemed to be enjoying himself. Alex Tydings was the biggest surprise. I knew she didn't look much like Aphrodite without the wig, makeup and push-up bra, but I didn't expect her to look so different that I probably wouldn't recognize her if I met her on the street. She's American, so her accent is the same, but of course she doesn't talk like 'Dite either. We heard later that Hudson had signed autographs for everyone in the room, then stayed another couple hours taking pictures with people. We didn't stay for that, being hungry, and anyway, we decided that an autograph was enough for us, however nice a picture would be. Some of the fans at this con really creeped me and my fiancee out. Some of them couldn't seem to distinguish between the actors and their characters (and it wasn't just kids doing that), and others asked for hugs, even though everyone knew they weren't supposed to. But all the actors were very gracious about it and gave hugs when asked -- thankfully not many asked. The rest of the con... well, let's say I liked the guests the best. The blooper reels were fun, especially the Season 2 XENA one that shows Lucy on the cross (in DESTINY [36/212]) singing "I've got a lovely pair of coconuts". But the music videos, while fun at first, started to get annoying after a while... "Oh, great. ANOTHER music video." They were basically bunches of clips with some semi-appropriate song in the background. Joxer, Ares, and Callisto had music videos of their own; Gab had several, as did Xena, Herc and Iolaus. The costume contest was amusing to watch, but a group of people won and I thought they should have been judged individually rather than as a group (no, I didn't enter). There wasn't as much merchandise as I thought there would be; I know there's more XENA/HERC merchandise out there! I was surprised they didn't have Real Entertainment there selling videos. So, overall, the con itself was okay, but the guests were by far the best part of it. We kept wandering in and out of the ballroom where the videos and other events were going on during the times when there were no guests. We saw Rob Weisbrot (author of the official companion books) and got him to sign the copy we had just bought of the HERC book -- our copy of the XENA one was at home. He said he'd been surprised that for every six or seven XENA books that sold, maybe one HERC book has sold. I'm not surprised, given the popularity of XENA compared to HERCULES. Overall, this was a lot of fun -- my first H/X con. I'm glad we went.